If you have been watching the affiliates section of the Hemp Bombs website, you might have seen fresh video and text content being added. Whether it has been an introduction to affiliate marketing, a video tutorial, or other affiliate post, we’ve been investing in our affiliate program. It benefits both our company and our affiliates if our affiliates become part of the “very successful” category. Now, we understand that some of our “top-performing” affiliates might do this as their profession or have a much wider audience than the average person. But, that doesn’t mean we can’t share some of the strategies that make our most successful affiliates successful. If you haven’t seen, tons of YouTube channels and websites make a living doing “product reviews.” For instance, if you enter the search term, “product review,” many of the high-ranking results will be review-only. Many times, these websites are created with the sole intent of working with affiliate companies. 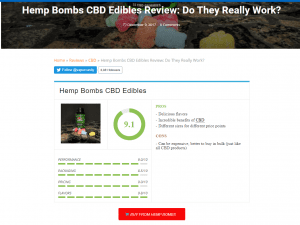 In written reviews, the goal is to rank for high volume search terms like “CBD Oil Review” so you can get a lot of eyes on your review. Make sure any outbound links are you page are affiliate links. That way, whatever link a visitor clicks on, you can receive credit for that sale. Interestingly, we’ve found that YouTube product reviews have been the most successful format for affiliate marketers. Here is an example of a video with nearly 50,000 views that has generated more than 30 sales so far. In this video, “DonnySmokes” does a review for our whole product line. He gives his reactions to the products as well his friends’. To give yourself a chance for the most sales, it might be beneficial to focus on individual products so you can create more videos. Now, this takes a little more time but the returns can be sweet. One of our strongest affiliates uses a dedicated coupon page to send referrals to Hemp Bombs. The great thing about coupon codes is that people looking for discounts are usually about to the pull the trigger on a purchase. So while normal conversion rates can be 2-3%, one of our affiliates is right at a 50% conversion rate. There are a couple ways you can earn affiliate sales with a coupon page. One of them is to direct traffic to your coupon page from your returning visitors. If you have a blog or reviews website, this is a good approach. In fact, affiliates with a product reviews page can “double dip” from their audience with a coupon codes page. ***Tip: Try to get a custom discount code from your affiliate vendor so you can provide your audience an exclusive deal. It seems like you, webmaster, “hooked” them up with a deal. The other way to use coupon codes for affiliate earnings is to create a strictly coupon-based website. Using this approach, you try to rank for popular organic keywords to become a destination for potential buyers. You can become an affiliate for multiple different companies. If you aren’t a current affiliate with Hemp Bombs, now is the time join. Our affiliate program has more resources than ever and this blog will give you a leg up on your way to making commissions. Visit our affiliate registration page to sign up today.